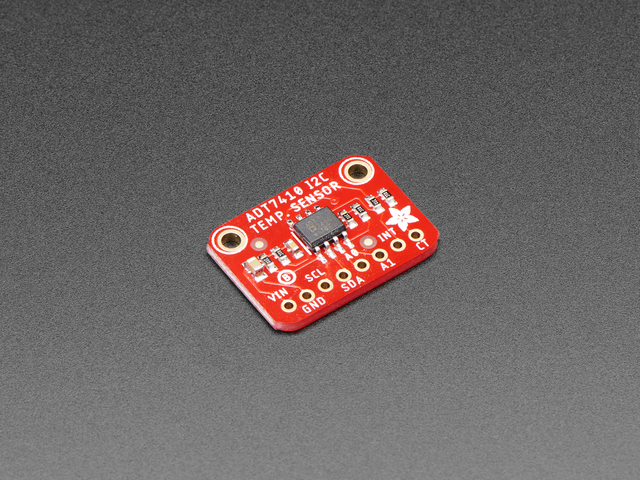 The ADT7410 has 2 address pins, so you can have up to 4 sensors on one I2C bus. There's also interrupt and critical-temperature alert pins. The sensor is good from 2.7V to 5.5V power and logic, for easy integration. We've got both Arduino (C/C++) and CircuitPython (Python 3) libraries available so you can use it with any microcontroller like Arduino, ESP8266, Metro, etc or with Raspberry Pi or other Linux computers thanks to Blinka (our CircuitPython library support helper). Each order comes with a fully tested and assembled breakout and some header for soldering to a PCB or breadboard. You'll be up and running in under 5 minutes! Thanks to Digi-Key and Analog Devices for sponsoring the development of this breakout board - we've made the PCB "Digi-Key red" in their honor!